With the thorough understanding of stem cell biology and the advent of targeted therapeutics for cancer, stem cell-based therapeutic strategies are being increasingly explored for the treatment of various cancer types. Mesenchymal Stem Cells in Cancer Therapy sheds light on current stem cell based targeted therapies for cancer, by focusing on the application of mesenchymal stem cells (MSC) in various cancers with emphasis on a number of aspects that are critical to the success of future stem cell based therapies for cancer. 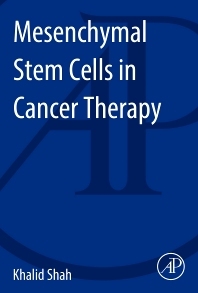 Sections of this publication are devoted to developing stem cell based therapies for cancer with the main focus on tumoritrophic properties of stem cells, engineering targeted therapeutics, utilization of imaging techniques and the recent combination studies utilizing currently employed therapeutics with stem cells. Mesenchymal Stem Cells in Cancer Therapy informs readers about critical and cutting edge stem cell therapies for cancer and also enables them to appreciate the vast plain of unresolved questions in stem cell research for cancer therapeutics. Includes biological foundation on key sources of mesenchymal stem cells and the various ways they can be utilized to treat cancer. Provides examples of current MSC based cancer therapies and prospects for the future with insights from the leading lab on cancer cell therapies. Technically advanced topic written for widespread understanding for clinical and research audiences. Dr. Khalid Shah is the Director for the Stem Cell Therapeutics and Imaging Program and the Molecular Neurotherapy and Imaging Laboratory in the Department of Radiology and Neurology at the Massachusetts General Hospital and Harvard University. He is Principle Faculty at the Harvard Stem Cell Institute in Boston, Massachusetts.